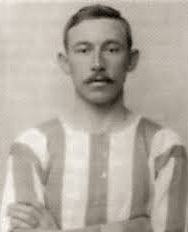 Joynes commenced his football career with Newark Avenue and then Newark before joining First Division Notts County in December 1901 where he scored three times in forty-six League games and also played in one F.A. Cup tie in the two seasons he was at Meadow Lane. He returned to Newark in May 1903 before joining Southern League Brighton & Hove Albion in May 1905. He had more than one hundred games there before following his Manager Frank Scott-Walford with several of his team-mates to Leeds City in May 1908. He showed his versatility in featuring in three different positions in his first season at Outside-Right, Inside-Right and Inside-Left and repeated the feat in his second season after which he left Leeds and did not play again professionally. He died in 1949.